Chef Brian Lewis, one of Connecticut’s most influential chefs and celebrated for being on the cutting edge of the state’s dining scene, opened his new restaurant, The Cottage, this past weekend. It is Chef Lewis’ second Fairfield County restaurant, redesigning the space that formerly housed Le Farm into a charming 44-seat establishment in the heart of town. Known for his thoughtful and innovative dishes that garnered him accolades from The New York Times, Esquire and Connecticut Magazine, The Cottage features his highly revered seasonal American cuisine in a warm and relaxing environment. Upon entry, a vintage factory window sanded to its raw steel greets the guests to the intimate restaurant, as arched top white wood mirrors create the illusion of more space. White wooden walls with dark grey accents, authentic oak wood floors stained white, and an antique mahogany bar dating back to the early 1900’s offer an ode to style influences of the past and Northern European tradition. Imported from Lille, France, the bar frames the kitchen with original brass brackets and finial details with glass shelving. Four wooden chandeliers exude warmth throughout the dining room, while aged wooden tables with custom painted chairs strategically occupy the floor. Fabric sconces highlight the hand hewn thick beams that grace the perimeter, as two industrial factory pendant lights in vintage style hover over the bar’s counter. A combination butcher block and Carrera marble counter offers four additional seats with a glimpse into the busy kitchen. The opening menu included hand-crafted dishes that were artful, yet approachable. Appetizers range from the simple Copps Island Oysters with Yuzu, and Ginger Mignonette, and Maple Bacon & Eggs with Robiola Cheese, to the more complex Sautéed Foie Gras with Vanilla Quince, Smoked Macadamia Nuts and Huckleberry. One of Chef Lewis’ perennial favorites, the Italian Chestnut soup spiked with Cognac, which I sampled at one of his pre-opening gatherings, was outstanding. The flavor, texture and richness of the soup was exceptional. With three pastas including Kabocha Squash Agnolotti, Foie Gras Cappelacci with Drunken Prunes and Almonds and Spaghetti with Lobster, the menu offered a glimpse of the creativity of the cuisine. I was fortunate to secure a table for Saturday evening and enjoyed several more of Chef Lewis’s inspired dishes. For my first course I ordered an appetizer-sized Lobster Spaghetti with sea urchin and Calabrian Chili. The pasta was a fantastic canvas the accompanying flavors. The chilies added a mild level of spiciness and the combination of the sweet lobster pieces and the richness of the sea urchin was a great combination. Before our entrées arrived the two of us shared the Wagyu brisket steam buns with Napa cabbage kimchi and duck fat potato tempura. When the plate arrived it was topped with two buns, several slices of brisket, sauce, aioli and the kimchi. I spread the sauce and aioli on the bun and added the meat and vegetables. The brisket was fall-apart tender and full of rich flavor. The kimchee added a nice offset to the meat and the sauces added a little creaminess. A touch of sweetness was added by the soft buns. The four opening weekend entrées included Cod, King Salmon, a pork rib roast and a Short rib cottage pie. I decided on the Cottage pie, which included a small kettle filled with the short rib and topped with mashed parsnip/potato and Cipollini onions. They were accompanied in the presentation by a bowl of roasted carrots. The meat was fork tender, earthy and outstanding, smothered in a rich, silky sauce. The parsnip-potato purée added sweetness to the meat and the roasted carrots were a wonderful complementing texture and more sweetness. The dish was delicious. The beverage program includes a robust collection of boutique wines from around the globe, served by the glass or bottle, to pair perfectly with Chef Lewis’ culinary style. “Our cuisine is inspired by classic and modern cooking techniques, with a constant pursuit of finding the very best ingredients available,” Lewis continues. “The menu celebrates cultures of Italy, Spain, France, Japan and most importantly, our direct Northeast region so I am thrilled to finally open our doors to the Westport community and to the friends who have followed my career to this point.” After my first of many meals at The Cottage I am also thrilled. The Cottage will be open for dinner from Tuesday through Thursday (5:30pm – 9:30pm), and Friday through Saturday (5:30pm – 10:30pm). Saugatuck Craft Butchery was founded in 2011 by Ryan Fibiger and Paul Nessel with the philosophy of combining “traditional butchery skills with sustainable, whole animal practices and modern-day food movement ideals.” It purchases locally raised animals from farmers that share this philosophy, dry-ages the meat in-house and sells directly to the public. Over the last four years, as its popularity increased, it expanded to a new, larger location across the street that would feature both a butchery and a restaurant and earlier this year it merged with Fleishers Butchery, of Brooklyn, to become Fleishers Craft Butchery. After the successful launch of breakfast and lunch service, Fleishers recently hired Chef Adam Truelove, formerly of Tarry Lodge, Napa & Co. and Pine Social to oversee its culinary expansion. In the last month it both opened its doors at its newest location in Cos Cob and expanded the service in Saugatuck to include dinner to showcase the farm raised meat and poultry from the butchery coupled with Chef Adam’s creativity. With a very low key environment, 30 seats and an additional six stools at the bar, the restaurant will offer a simple menu, as well as Family Dinners, from Tuesday through Saturday from 530-930PM. CTbites was invited to sample a selection of the new cuisine. The “Apple and Fennel Salad” was one of the best renditions of the currently popular kale salad I have tasted. The kale, slivered apples and fennel were tossed with a house-made bacon vinaigrette, shredded goat cheese and pistachios. The bacon-y vinaigrette was a fantastic complement to the kale with loads of smokiness that created a delightful combination. The apples brought a mild sweetness and the goat cheese a touch of saltiness. The pistachios rounded the salad with a nice earthiness and additional crunch. The “Lamb Meatballs” were nestled in a swath of smoked ricotta and finished with a spiced red wine reduction and slivered scallions. The Indian influenced meatballs, seasoned with curry and cumin, were complemented by the creaminess of the smoked ricotta. They were soft and moist from the steaming and reheating in the wine reduction, which added a slight bitterness to the dish. The last small plate was the “Crispy Pig,” which included chicharrones and thinly sliced strips of pig’s ears, which were braised before deep frying. The strips were coated with a spicy Sriracha sauce and parsley, and served with aioli. The chicharrones were crunchy pillows of air while the pork strips were the textural opposite; a chewy, crunchy texture. I was not a fan of this combination (a personal preference) but others at the table loved it. When you are sitting adjacent to one of the best butchery around, it is hard to select which of the entrée to choose, with a double-cut pork chop, a half chicken, steak frites (currently a Rib Eye) and a lamb dish all an option. The highlight of the visit was the “Rib Eye,” the current cut for the Steak Frites. Since we enjoyed the fries earlier with the burger, Chef Adam paired the chop with brisket burnt ends and beans. After one bite, I knew this was an outstanding steak. The 16-ounce filet was cooked to a perfect medium-rare, with a great sear on the exterior. The deep, ultra-rich flavor was fantastic, fork-tender and reminiscent of a great steak house. The side of brisket burnt ends and beans was a wonderful accompaniment that both mellowed and enhanced the steak. The “Pork Chop” was an enormous double-cut chop served atop a mound of sausage stuffing and a small side salad. The chop was served medium-rare and pink in the middle (order differently if desired) and glazed with a pomegranate molasses and finished with a dash of Gray rock sea salt. The sausage contained house-made sausage and brioche and offered just a hint of spicy-sweetness. The chop was moist and flavorful and delicious with the sweet pomegranate glaze. Overall, the initial offerings at Fleisher’s were fun, creative and showcased the top-tiered quality of the butcher shop. Chef Adam informed us after the meal that lamb will be a continual offering to expand the year-round acceptance of this wonderful meat. The prices reflect the restaurant’s ability to offer exceptional quality at relatively reasonable prices. The $32 rib eye steak frites was a great value and the other entrées were priced in the mid-$20s. I look forward to returning to Fleishers to work my way through each of the meats and poultry. Vespa Restaurant recently introduced its new culinary team, Executive Chef David White and Pastry Chef Susanne Berne to create a vibrant menu to complement the relaxing décor and wonderful water view. The duo will collaborate in creating a menu for the full dining experience, from the first bite of Antipasti to the last bite of Dolci. In addition, the restaurant recently unveiled its lunch service, a new dessert menu and the commencement of “Apertivo Hour” from 4-6PM, offering half price beer, wine, $8 select cocktails and a small plates menu. Chef David joins Vespa from The Inn at Pound Ridge, where he was the Chef de Cuisine. Prior to working with Chef Jean-Georges, he sharpened his skills in Europe before returning to the US to further refine his talents with award-winning Andrew Masciangelo at Savona. Chef Berne’s passion for the culinary arts was sparked by a pastry course in college before receiving her Grande Diploma in Pastry Arts in 1999. She subsequently won back-to-back ACF Florida Pastry Challenges in 2003 & 2005. CTbites recently visited Vespa to sample a variety of the new culinary team’s Italian-inspired creations. The highlight of the meal was the Spicy Lumache (pictured above). The house-made, snail-shell shaped lumache was perfect for Vespa’s chunky and robust heirloom tomato sauce, which included broccoli rabe, large chunks of spicy sausage, charred fennel, and sprinkled with sourdough breadcrumbs. The heirloom tomato sauce delivered a touch of spiciness from the addition of Calabrian chilies and included chunks of spicy sausage, with additional heat from a smidgen of red pepper flakes. The broccoli rabe was soft and void of all its inherent bitterness, and the fennel added a wonderful earthiness. This was an outstanding preparation and one of my favorite pasta combinations in a long time. We sampled three dishes from the “Secondi” section, the best was the Short Rib Sandwich (seen above). A toasted, buttery brioche was filled with two good-sized pieces of short rib, a slice of lettuce and a mound of slaw served along with shoe-string fries. The meat was braised low and slow for over two hours, and was soft, delicious and incredibly flavorful. The slaw was creamy and delivered a surprise, a nice little kick from the inclusion of Calabrian chili and the brioche was a great choice for its butteriness. This was one of the most incredible sandwiches I have eaten in a long time. The Crab Cake was excellent. Two large crab-laden patties were crispy on the exterior and soft and moist on the interior. It was almost exclusively crab meat, very little filler, with a bit of crunch and sweetness from a few finely diced peppers. The two crab cakes were covered with shredded vegetables that were lightly pickled to balance the dish. The last Secondi was the Poached Eggs. Two poached eggs were joined on the plate with grilled asparagus, pancetta and finished with a few slices of smoked salmon. The poached eggs were cooked well and the grilled asparagus were tasty but the salmon was less than appealing in both texture and taste, and the pancetta was overwhelmed by the sherry and was too sour. We next moved to a trio of desserts currently on the menu and one that will join shortly. My favorite of the current choices was the Peanut Butter Crunch Cake. This cylinder shaped extravaganza began with a layer of banana cake, topped with layers of milk chocolate peanut butter crunch, and peanut butter cremeaux, all encased in a chocolate glaze and served with a scoop of chocolate gelato from Gelatissimo in New Canaan. The soft banana cake was moist and delicious with the middle layer was reminiscent of a Butterfinger candy bar with a crunchy-gooey texture. The chocolate glaze was outstanding and the gelato was a great complement to the other ingredients. The cake was joined with a few slices of bruléed bananas to further accentuate the banana cake. This dessert delivered a balance of one of my favorite combinations…banana, chocolate and peanuts. The Pistachio Opera Cake presented a completely different profile. Three layers of pistachio sponge cake were intermingled with a layer of pistachio meringue and a layer of chocolate ganache, finished with a pistachio cream. It was presented alongside sour cherry jam and a scoop of chocolate gelato. The meringue presented a textural contrast to the soft cake and the sour cherry jam was a great addition to balance the other delightful ingredients. The last of the current desserts was a plate of Family style Zeppoles paired with chocolate, caramel and a white Sangria sauces. The warm ricotta donuts were crispy on the exterior and soft and moist on the interior. Although deep fried, these were virtually oil-free to the taste, but they were a bit bland. They were sprinkled with powdered sugar, which added a hint of sweetness before dipping into one of the sauces. The three sauces were all delicious and delivered the required sweetness. Chef Berne saved the best for last with her Coconut Panna Cotta, a tribute to the Pina Colada. This delightfully refreshing dessert was served in a glass ramekin and began with a perfectly prepared coconut panna cotta, which was smooth and luxurious. The second layer was the Sangria gelée which added a wonderful sweet component with the inclusion of passion fruit and white peaches. The two layers were topped with chunks of spiced pineapple. This was a fantastic combinations of traditional tropical flavors that were outstanding. Overall Vespa 2.0 has a wonderful cuisine to enjoy in the beautiful and low-key environment with a relaxing water view of Saugatuck River. 2A Post Road West – Westport, Connecticut. 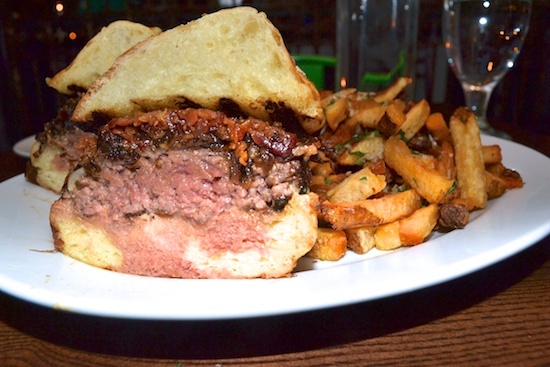 Once again Chef Matt Storch’s “Match Burger” takes one of the top spots in my annual review. Anyone on Chef Matt’s FB page sees his weekly Thursday posting announcing the Thursday Night Special Burger night with a photo of perfectly prepared burgers. The Match Burger delivers an incredible array of flavors and starts with a rich, grass fed short rib, chuck and brisket combination. After grilling the patty to create a crisp char and smokiness, the burger is dipped in a Bacon-Cheese Béchamel and then bacon bits are placed atop the cheese-dipped burger to add saltiness. The burger is finished wit a heaping of sweet & sour onions and encased in a sweet onion brioche, which added just a little more sweetness to the combination. The fries at Match were outstanding (maybe the best in the area), crunchy on the exterior, soft and moist on the interior and were the perfect complement to the burger. There was both a change in chef as well as a change in the toppings from last year’s first place finish. 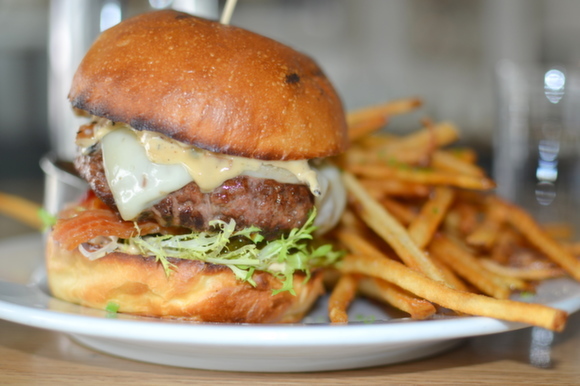 The 2015 “Dry Aged Beef Burger” at The Whelk was simpler than last year’s version and combined a rich blend of rich dry-aged beef topped with sweet pickles, belle bantam cheese, bacon and onion mayo on a brioche bun. The beef was perfectly seasoned and still delivered a rich flavor, which was complemented by the sweet pickles. The sauce added a wonderful sweet and creamy addition, while the nuttiness of the cheese and the smoky-saltiness of the bacon added additional flavors to the burger.